Accountable democracy in local government is a cornerstone of our constitutional tradition and a valuable tool in the hands of NZ ratepayers and citizens. 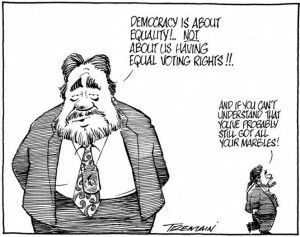 Any tampering with this age old right – such as special race-based and undemocratic Maori wards – is detestable to most people and a crime against NZ’s democracy. 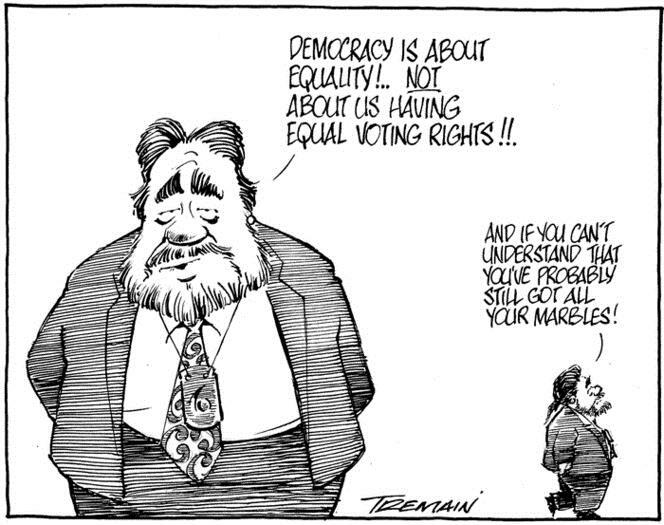 In the past, when a special Maori ward has been proposed for a council, ratepayers’ polls have consistently rejected race-based wards, preferring accountable-to-ratepayers’ democracy. A recent such rejection being in New Plymouth where in May, 2015, 82% of ratepayers said No to the creation of Maori wards. They feared that unelected part-Maori appointees, unanswerable to ratepayers at election time, would make huge demands on the council’s purse. That’s what happened in Auckland where special Maori appointees have demanded $295 million of ratepayers’ money for their own special, race-based purposes such as the upkeep of maraes. Effectively, there’s been a nationwide ratepayer revolution in which all polls have shown the natural hostility of ratepayers to having race-based council appointees. Especially as they would spend ratepayers’ money on racially biased projects. Faced with those results, the all-time National Party trickster, Christopher Whinlayson, is now imposing those very same burdens on ratepayers without them having any say or redress in the matter. He’s doing it through parliamentary legislation imposing Treaty settlement obligations on local councils. For example, in 2012 National imposed a treaty settlement “co-governance” agreement on the Hawke’s Bay Regional Council, which was thereby statutorily FORCED to set up a co-governance committee with the Ngati Pahuawera, to cover all natural resources in the area. And yet the victims of these thefts – blind bigots born with a blue ribbon choker – still rush to the polls to vote for that “nice,” smiling assassin, Mr. Shonkey.